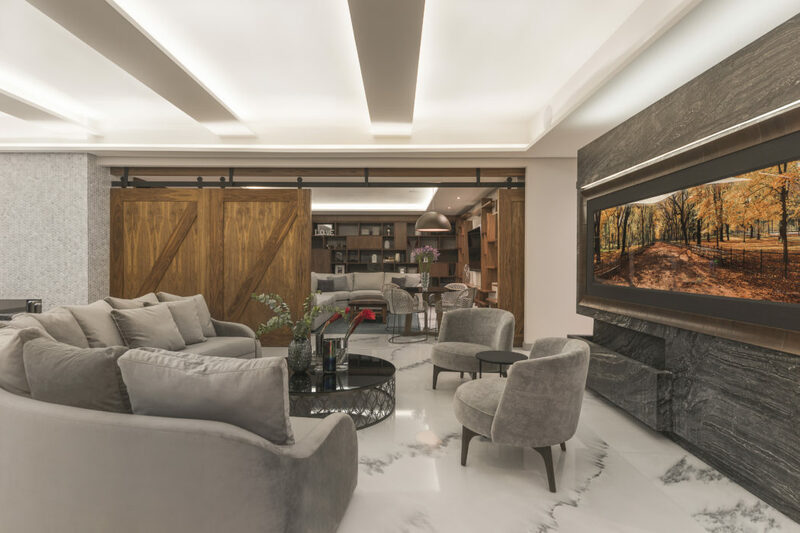 This inspiring luxurious apartment located in Mexico City, Mexico, was designed in 2017 by Kababie Arquitectos. For this project, the customers asked us for warm and harmonious environments that generate peace of mind without losing modernity. They wanted to express their essence in all the spaces through different textures, colors and furniture, carefully selected for them. The budget for the entire project was 500,000.00 euro. In order to meet the customers requests, the premise of the project was the inside/outside connection to generate open and versatile spaces that could change from public to private through a subtle transition. The central axis of the project was the public area (lounge-dining room-dining area) dividing spaces through different materials and textures without dividing walls, thus providing a feeling of spaciousness, integrating both classical and modern art pieces and taking full advantage of natural lighting. We designed a double-function fountain inspired by the Mexican sculptor Jorge Yázpik. It also has 2 original photographs of Peter Lik. We used a dark and intense color palette to balance furniture and convey elegance. The master bedroom seizes natural light allowing spaciousness and achieving an inside/outside connection. The main bedroom lights are Fandango lamps by hive. The study room lamp is from Marcel Wanders.